Last October, the Deepwater Project, led by Nobel laureate Martin Beniston, was the winner of the first ever GLOBAL+5 Innovation Award. Thanks to support from the University of Geneva, the Dudley Wright Foundation and private donors, The Global Journal is proud to announce that PlanetSolar - the largest solar catamaran ever built – will set off at the beginning of April from La Ciocat in the south of France on its very first mission to conduct a unique three-month scientific expedition. Operating with zero carbon emissions, the boat will collect data along the relatively unexplored Gulf Stream, documenting the behavior of the ocean atmosphere interface and the current’s role as a climate regulator. Gerard d’Aboville, a veteran navigator and French adventurer of the North Pole, is the captain of the solar catamaran during the expedition. With its mission base in Geneva, The Global Journal spoke to Beniston ahead of PlanetSolar’s departure. Everything started exactly a year ago with Arnold Schwarzenegger’s visit to Geneva, where he inaugurated the R20 – his association of regions to find technological solutions to climate questions. At the time, we thought that with the imminent return of PlanetSolar we could perhaps convince Schwarzenegger to come back as part of the Cannes Film Festival because the boat would have been in Cannes at that moment. Notwithstanding this idea to create media interest in the event, the University of Geneva was in any case already present in the mind of Schwarzenegger given he organized the R20 inauguration conference here. Eventually, I was asked if we could finally do something scientific together and from this moment the idea was born to use the boat to measure the Gulf Stream in quite unique conditions as PlanetSolar operates with zero emissions. Usually, in the part of the atmosphere where such experiments take place, we cannot use measures free from entropic pollution. That is why we are certain we can obtain more accurate results using measures from natural origins uncontaminated by pollution. Were the measures developed previously? And as a scientist, what kind of link do you expect to find between these measures and climatic changes? The Gulf Stream has been a climate regulator for a long time, especially in the North Atlantic and more particularly in Europe. What is quite innovative is that on the one hand we will measure all the trajectories of the Gulf Stream – from Florida just beyond the point of Ibiza towards Europe. We will go further north into colder zones. At the same time we will measure physical, chemical and biological properties linked to the atmosphere of the ocean and this is really something totally new. You have expeditions that have measured certain physical properties in certain places – others have measured chemical properties in other places. But in general, having a boat do this experiment is something that is extremely expensive and demanding. That is why the best-case scenario is to have a boat at your disposal for perhaps 15 days or three weeks to see if you can target something in particular. Then, you have all the liberty and all the time to see a process connected to the Gulf Stream but also all processes in other areas. In terms of physical properties, there are quite standard measures such as temperature, humidity, pressure, wind-speed and direction in the atmosphere, but also thermal properties, salinity and density. What we will be looking for is to better understand the exchanges that occur between the surface layers of the ocean and the lowest layers of the atmosphere – what is happening there? When we use all these mechanisms that modulate the climate on a larger scale, we can try to really understand the interface between the ocean and the atmosphere. We can have a better idea of the energy fluxes and aerosol fluxes, which consist of solid or liquid particles that are suspended in the atmosphere. They also play a direct or indirect role on climate change either from sunlight or their part in nucleus condensation, where mini particles make the process of condensation more efficient. So we know very little about what is going on. Why does the ocean like this quantity of aerosol in the atmosphere? So it will be interesting to see which part of the Gulf Stream likes which type of aerosol. Is it the sulfate aerosols or other aerosols that contain a biological signature? Are you talking about evaporation of water? No, it is more related to wind friction against the surface of the ocean that can lift up droplets. The waves that crash, however, release a very large quantity of aerosol. For instance, we estimate that around a third of sulfate aerosols are produced in mass when we burn carbon and petrol – which contain sulfur – and the ocean consumes 30 percent of all such sulfur aerosols from the atmosphere. These are immense quantities even independent of all human activity. We will try to see whether this is uniform in the ocean or whether there are zones emitting these types of sulfur aerosols that are more concentrated in the warm area of the Gulf Stream or in the cold area. We don’t know the answer in advance, but it would be interesting to quantify all of this to better understand the mechanisms of exchange between the ocean and the atmosphere. Does this particular type of boat and scientific expedition pose any security problems? For security I should direct you to the technician of Planetsolar. But in my view it doesn't pose any more security problems than a regular plane to the extent that this boat has proven itself during its world tour, sometimes in difficult weather. It was tested in a tropical storm and a monsoon between Australia and Asia, in the Philippines. It is an extremely stable boat with quite a particular catamaran technique where it attacks the waves – the buoys stay in the water even if the waves break underneath. So for the team who are not necessarily seamen this will be quite a comfortable experience. In theory, I do not have any concerns about security in terms of the boat. We may have some other doubts about the boat because during its world tour it did not stay long between the two tropics of the equator where there is maximum sun. But according to the assessment by our partner Meteo-France, which has developed a routing program for the boat that can position it in accordance with optimal sun conditions – during storms for example, in the season in which we will navigate north of Iceland – it is completely feasible. There is no large risk – they doubt that we will break down because of a lack of sun. We could potentially encounter delicate conditions in terms of a storm in the North Atlantic. Effectively, however, we are not going to encounter hyper-extreme conditions as if, for instance, we were trapped in the Antarctic ice. We will leave the Tropic of Cancer practically just at the polar circle with a change in the weather and behavior of the ocean. We will pass into an ocean just before the hurricane season in Florida – we hope – and we will pass through to the north of Iceland and in principle avoid Titanic-era icebergs. What equipment do you need on board? There are several types of instruments. There are the instruments that are submerged – the instruments that will measure the content of physicochemical oceanic properties, like temperature, salinity and density. We will make two stops per day in order to carry out surveys, at a depth of around 250-300 meters. We will survey morning and evening the deep layers of the ocean to see not only what is happening close to the surface, for example, but equally different points of depth that account for the basis of change in water mass. In addition, we have standard meterological measures that are part of the package provided by Meteo-France for the boat and we also have two instruments developed by the Physics Department here at the University of Geneva, which will measure solid aerosols. This is a commercial device. We also have a device that was developed by the University to detect biological aerosols, bio-aerosols. This is an instrument that measures pollen in the atmosphere. Since these atmospheric pollens are a little bit similar in size to marine micro-organisms, we decided it is worth a try to use this instrument called the Box Corer in oceanic conditions. It is an instrument that collects the air hopefully containing all types of aerosols and is able to determine the types of micro-organisms and their abundance. We also think we will be able to detect the biological signature of water mass transitions, for example warm or cold water masses. We have turbines that break away in the main area of the Gulf Stream, which start to twirl in the ocean. 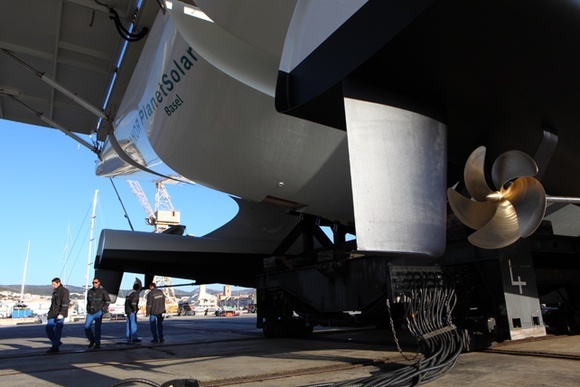 One of the roles of these turbines is to channel the heat but also trap phytoplankton, that is marine organisms. We think we can detect the presence, absence or abundance of these organisms with these atmospheric instruments, which coat the atmosphere.